EDIT: For those with the R&D Pack could your techs be made out of the latest blocks? I've been on a bit of a carrier/drone kick recently so here's the Scorpion, another carrier which uses drones for combat and gathering assistance. It uses twin autocannons, turreted railguns, plasma jaws, and a pair of Horizon gyroscopes in terms of new experimental blocks. Press X to release the drones. Gun down resources and see how much the drones gather and deliver. This time, I'll bring the full-on aggressive tech pain. Bypasses shields enough to damage aircraft, but the damage is negligible against land crafts. Works fine anchoring and un-anchoring after X-press. A working flak because the Repulsor Cannon isn't working. Purpose is to wreck largest and toughest enemy techs or enemy waves. Charge up from the tower (and also anchor). Controls like a helicopter. Shift - up and control height. W S A D - flight directions. Space - fire. Keep tapping shift throughout to control height during forward and turns. Fly around destroying all visible techs. Can reverse/brake too (D). Destroy group of techs at R&D -150, 200 with one shot. Destroy The Brick with 1-2 shots. Oh, you did submit it as a save already, last week (thought I was seeing double). But it wasn't shown, eh. That's a shame. Twistin(V2): Which one looks better? The original tech, a fixed refit, my version inspired by them with a twist and a helicopter. (The helicopter is the same tech as the one on top of the biggest one). HOVER MOUSE OVER PAYLOAD TERMINALS FOR INFO. FOR BIG ONE, UNANCHOR, RETURN TO CHECKPOINT (there is techs there you can fight if you change them to enemy), DRIVE, AND PRESS X FOR HELICOPTER. HELICOPTER HAS SHIFT TO GO UP AND W FOR FORWARDS BUT TURNING IS REVERSED. Monster truck . I don't know what to call it so it's called Nyoom. DRIVE AROUND. PRESS SPACE FOR FLAMES. Hold SHIFT to go down, otherwise is functions like a normal. Since I saw that devs don't wan't to charge up, I have to put a save file. INSTRUCTIONS：Use it. Starts anchored, so don't ask why it can't move. Move slower to avoid tipping over. Press X and you're off! Make sure you're not anchored if you want to take off, shift to gain altitude, there isn't much else to it. "ZG Bike leans in" - A bike that leans *into* turns, somewhat like a real bike. A concept I've got bored of sitting on all year, so here you go! Do lots of slalom turns on the flat! The wings are needed to pull the bike inwards at speed (they have to be on the front, due to the control system). And the propellers hold at low to mid speeds. I initially used GSO fans, which are more compact and less overpowered for this, but I decided to go for a full Venture version for show. I could make a version with weapons, for an population enemy tech... But bikes can't turn on the spot, so I think it might flummox the AI a little. Viable still, I think. "... But bikes can't turn on the spot, so I think it might flummox the AI a little. Viable still, I think. Perhaps I will submit it to the next comcore . Maybe even to this one? This was more of messing around to see what's possible. 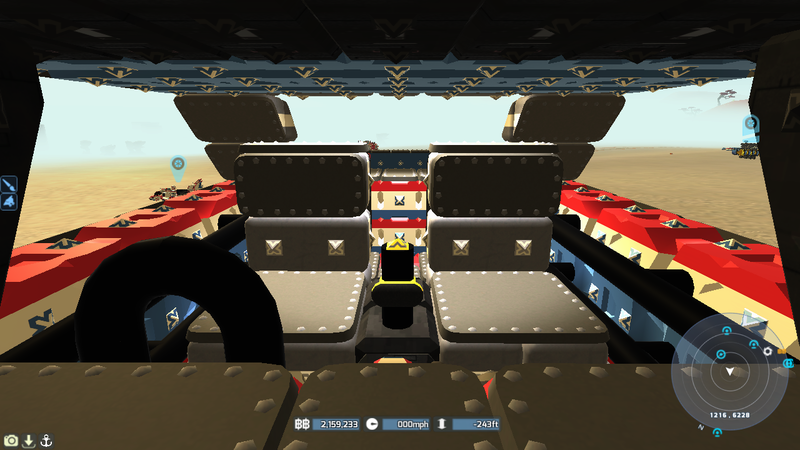 So this is one tech that shows current bugs in TerraTech. The Repulsor Cannon can't track targets properly when it's on its side, as it rotates to unusual directions. But it still fires horizontally when no targets around. 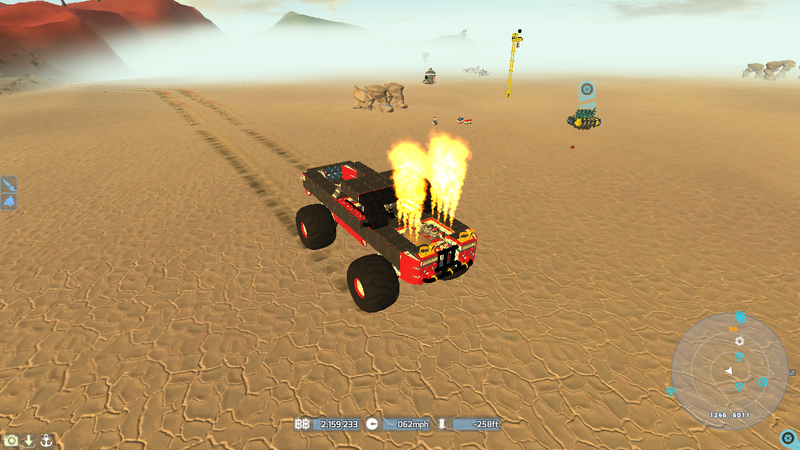 The Plasma Flamethrower splits into two flames when it strikes a wheel (specifically one of the Hawkeye bike wheels). Very cool effect, but possibly not as intended? Movement is reverse when a tech is rotated. And it doesn't matter what angle its rotated to, as the movement is always reversed. Even more unusual is turning when a tech is rotated: moving and turning function as they should, but turning while not moving is reverse. 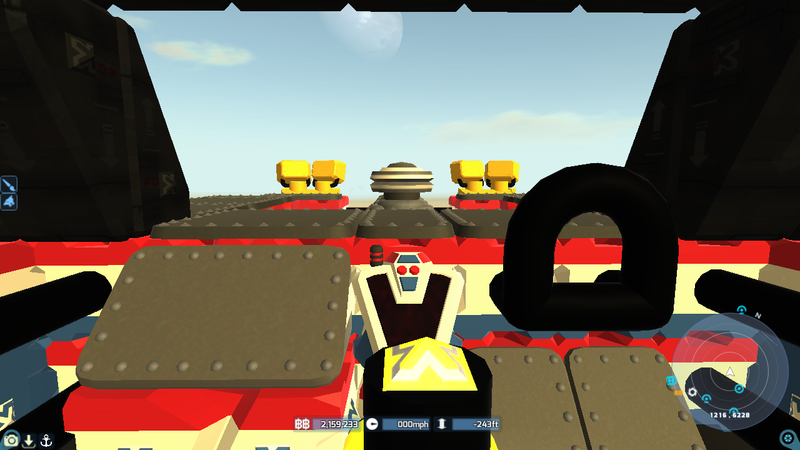 When rolling along as a giant wheel, the user is continually spammed with the message to press B for build beam to turn the tech right-side up. Pressing B at specific angles will not only turn the tech right-side up, but also flip it completely around, changing its heading 180 degrees. Ah, you updated your deadly little bike (I tried that ages ago, too!). Regarding turning - it's kinda cheating because the back end is half hover-tech, but I really can't complain given the combination of performance and looks. Greatly improved for the release version - very stable and turns exceptionally well. Planey was originally a one-layered aircraft, built for transporting USB sticks on the mildly soggy planet Djauridius. Djauridius's atmosphere was too humid and foggy for wireless communication, but Planey allowed the local Team Venture branch to simply fly packets of data around without hassle. This advantage vanished when some GeoCorp engineers got together with a gang of mostly-legitimate feather duster traders and built some underground cables, so the Venture branch converted Planey into a fighter. Planey's tail was blown off after a few engagements, forcing its pilot to build a much shorter one from the few blocks he still had. This gave Planey a catastrophic tendency to nose downwards, hence the upper wing, which allowed for much more graceful flight. Thought I'd mix things up a bit and submit a tech for Com Core myself No instructions needed as I'll be on the stream.